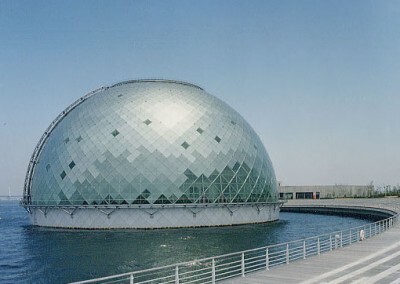 The Osaka Maritime museum is a 73m-diameter glass dome in Osaka bay, designed to protect a full-scale replica Japanese ship. 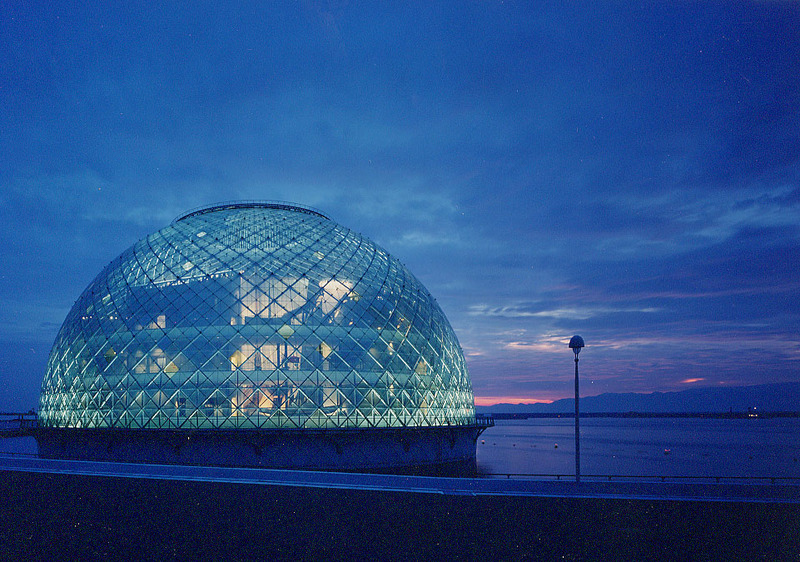 The dome is built on a concrete base, with deep piles anchored in the sedimentary soil of the bay, and is connected to its shore-based entrance pavilion via an undersea tunnel. 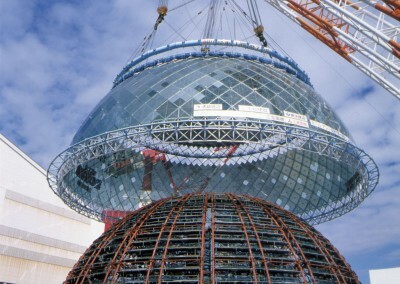 Paul Andreu is the architect of the dome. 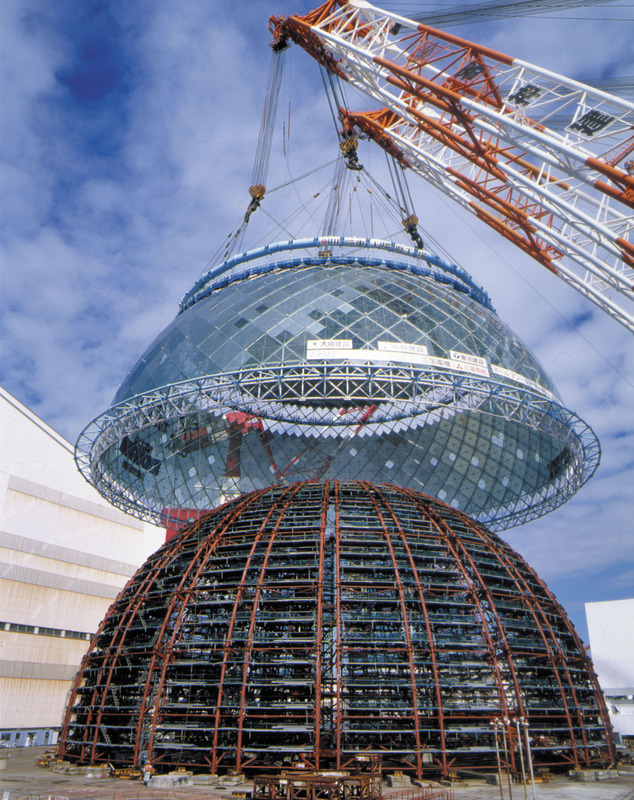 He called in Hugh Dutton to provide a technical design service for the steel and glass dome during ‘basic design’ phase, and to ensure the smooth running of the communication interface between the engineers Ove Arup in London and Tohata in Japan. A glass dome in Osaka’s mediterranean-style climate raises the challenge of finding a solution that gives a clear view of the harbor whilst limiting internal overheating due to the greenhouse effect and also withstanding Japan’s particular design constraints of typhoons, tsunamis and earthquakes. 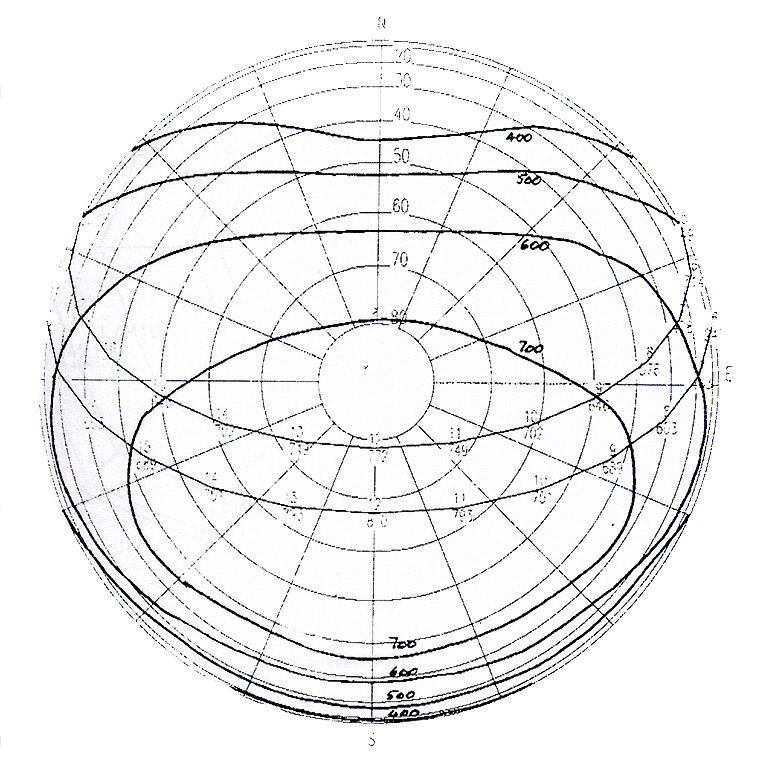 projected onto the hemispherical surface and represented as a series of contours of variable porosity, i.e. 90% solid at the pole, through 80%, 60% and 40%, finishing up with with clear glass on the equator, in the north and south. 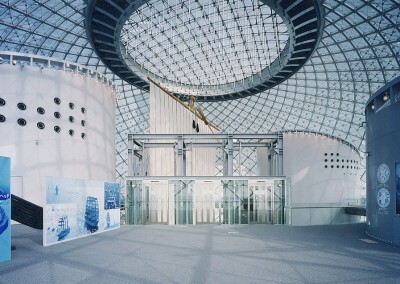 The variable porosity confers on the dome a didactic expression of incident solar energy, whilst maintaining maximal transparency towards Osaka harbor, for viewers within the dome. The dome structure is a gridshell in 200mm diameter steel tubes, with cast nodes and diagonal rod bracing. 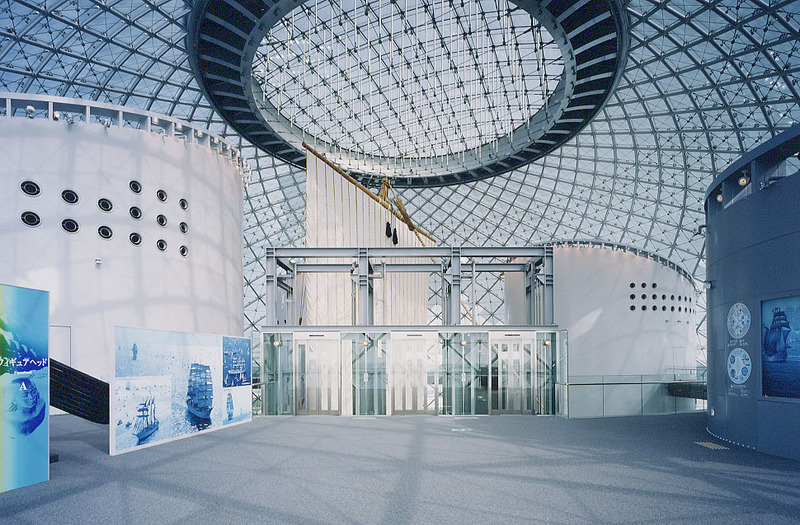 The crowning skylight is a cable net ‘lens’, seated within a circular vierendeel perimeter frame which incorporates ventilation panels. 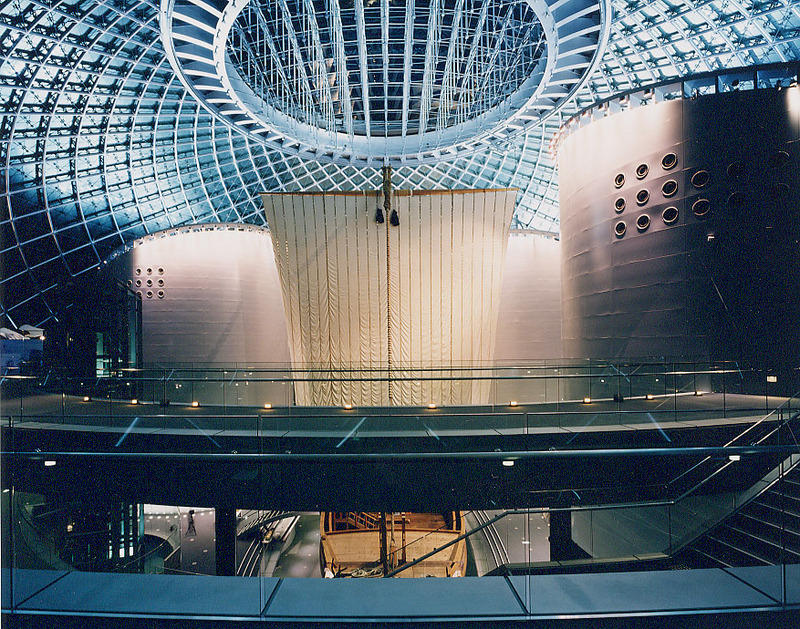 The glazing was a specially-developed single-glazed laminate, incorporating perforated steel sheets for shading and using the point attachment system developed at La Villette. 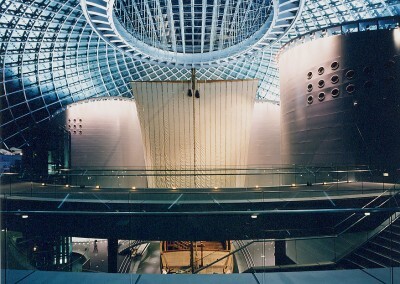 With the assistance of Hugh Dutton, this point-fixed system was concurrently marketed in Japan by Asahi Glass, under the brand name Tempoint.